My most recent motto has been, “it’s better to do something because then you’ll have done it.” Does it sound a little obvious or redundant? Perhaps, but for me it’s a good reminder, because I have a tendency to not do very much when left to my own devices. I get complacent and revel in the peace and quiet. I haven’t stretched myself much lately. I haven’t taken classes, I haven’t tried many new things, I haven’t traveled. I want that to change, so, simply put, I’ve made an effort to start doing stuff. Lately this new motto of mine has helped convince me to do Artomatic, to finish the Sketchbook Project Ltd. Edition and send it off by the deadline, to take on more freelance work even when I was already busy, and to sign up for 2 travel workshops with Light Grey Art Lab! I believe the girl pictured above is none other than THE Alyssa Nassner of Small Talk Studio. She is one of the creatives at Paper Bicycle, as well as a freelance illustrator. Do you guys know about Light Grey Art Lab and their sister company, Paper Bicycle Creative? I first discovered and got to know Lindsay Nohl, Francesca Buchko, and Chris Hajny, all from Paper Bicycle, when they started their daily pattern challenge. I was way too busy at the time to do more than watch what they created everyday, but it was an amazing inspiration to see such a variety of new patterns pop up on a daily basis, created by incredibly talented artists. Months later when they announced that they were launching a new business, Light Grey Art Lab, where they would be teaching courses at a new studio space in Minneapolis, I was so excited for them, but also a little jealous of all the people who were lucky enough to live nearby. Lucky for me, one of the first classes they posted was a “travel workshop”. When I saw the topic, I pretty much freaked out with excitement and knew I wanted to go. 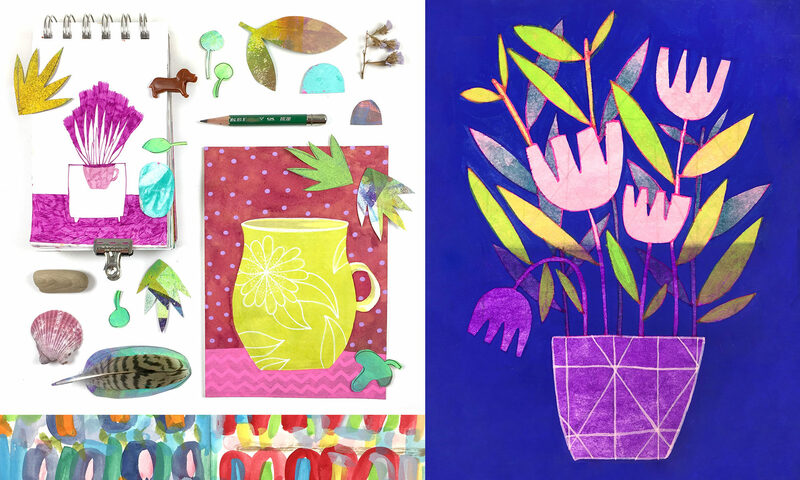 They put together a workshop that would take place at Surtex in NYC! It included access to the show, as well as lots of instruction about all kinds of things related to the business of surface and textile design. As excited as I was, and as right as this workshop felt for me, I was a little nervous about signing up. True, designing patterns is definitely a dream of mine, but it’s always seemed to remain just out of reach. A couple of years ago, I actually thought about going to Surtex to do a walk through, but I was too chicken. I imagined getting overwhelmed and lost in the crowd, so in the end I “didn’t see the point”. I knew that the chance to go to the show with creatives who were familiar with the industry would make a world of difference, so after contemplating for a few days I made the decision to go, and went to sign up for the workshop. And it was sold out! I was heartbroken because I wanted to go so bad. I kicked myself for waiting even a few days to make my decision. The only thing I could think to do was write to Lindsay to say that I’d be very happy to take someone’s spot if they weren’t able to go for some reason. Lindsay is one of the friendliest people on the planet, and in this case she was also my hero. She wrote back to me to say that hope was not lost. She was going to see if it was possible to create a few more spots on the trip. It took a while to hear back, but eventually Lindsay worked it out so I could go! She even managed to get me a roommate so I wouldn’t have to pay extra for the hotel! With a second chance to go, I didn’t waste any time signing up! By now I have gone to the Surtex workshop and returned home again, brimming with ideas and inspiration. First Day of the Surtex workshop, meeting right outside our hotel. I’m going to write another post just about my Surtex experience, but I also want to tell you about another travel workshop that popped up on the Light Grey Art Lab site a few weeks ago. This one is called “Illustration Bootcamp” and it’ll take place at Light Grey Art Lab in Minneapolis. It’s led by guest instructor/illustrator extraordinaire, Meg Hunt, and was marketed as a travel workshop to encourage people from other cities to come join the fun. I let this one stew for a while too (didn’t I learn my lesson the first time? ), but luckily it didn’t sell out before I made up my mind to go. Looking back on the memory now I think, “how odd!” and I wonder where that thought came from. But like it or not, the belief ingrained itself within me, and I’ve believed it for years: I might be creative, but I’m no illustrator. For me to sign up for “Illustration Bootcamp” took some guts. I still feel a little like an interloper–like it’ll be really obvious that I don’t belong or something–but in the end I decided to do the workshop because it’s something I’m interested in, and I know I’ll walk away from it with the benefit of the new experience, gaining knowledge, inspiration, and hopefully some more creative friends. At this point I’m especially excited about the trip now that I’ve met some Minneapolis based creatives who were part of the Surtex workshop. It’ll be great to reunite with some of my new “old friends,” but I’m also very excited to meeting the other participants in the workshop, including a couple of online friends, Emily Balsley and Lisa Marie Tsering, who signed up for Illustration Bootcamp too! Can’t wait!